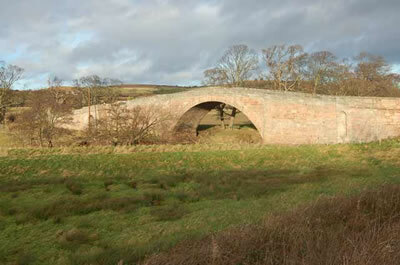 A five day, long distance trail from Melrose to Lindisfarne, it has approximately 62 miles of great walking and is named after the 7th century monk who was the Prior of both Melrose and Lindisfarne Abbeys. St Cuthbert's Way is best walked between May and September when the days are longer and the weather kinder. Although there is no particularly high ground on the trail there are sections which are exposed and quite dramatic. Northumberland coastal paths and of course the E2 European pathway. Start at the Information centre and the walk then climbs steeply between the Eildon Hills. The twin peaks will be a reminder of your first day and will be visible throughout your walk through the Scottish Borders. It is well worth a short detour to the top of one of the Eildon hills. As you walk this path bear in mind that you are also along the E2 European pathway which runs from Stranraer to Nice in the south of France. 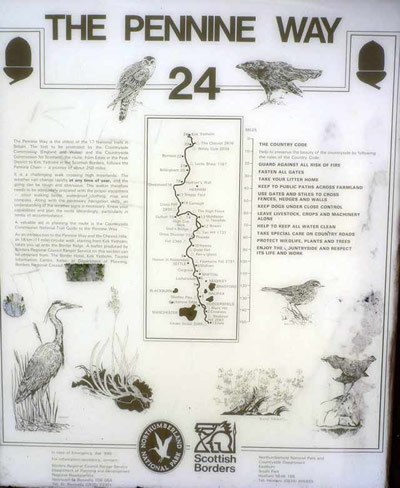 This part of the trail is also popular with people walking between Lands End and John O' Groats. 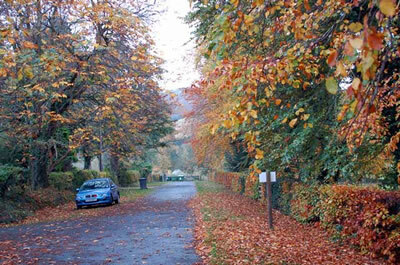 Take advantage of the path running through Newton St Boswells to buy refreshments. You can cross the Tweed here and pay a visit to Dryburgh Abbey. The walk now runs alongside the Tweed until you come to St Boswells itself. You will share the same path as Dere Street, a Roman road which is part of the Roman Heritage Way which links Melrose with the Hadrian’s Wall path. 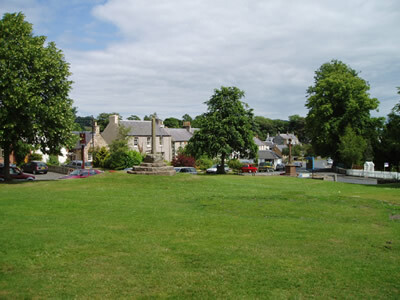 By evening you want to reach Jedburgh and either a campsite or one of the hotels or B&Bs. 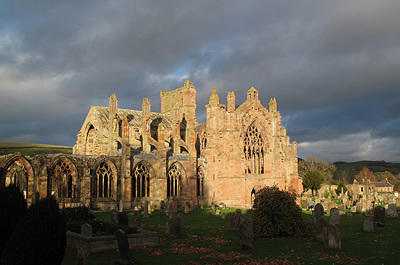 Historical facts: Melrose Abbey was founded by Cistercian monks in 1136. The embalmed heart of Robert the Bruce is said to be kept here. Dryburgh Abbey was founded in 1150. Like the Abbey at Melrose it has suffered over the years of the Border wars and the Scottish wars of Independence. Sir Walter Scott and Douglas Haig are buried at Dryburgh Abbey. 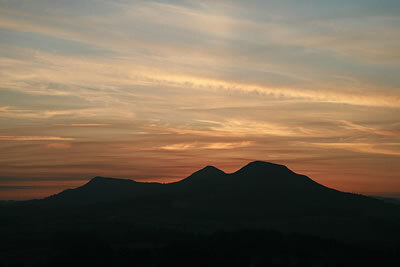 The Eildon hills were used as a Severan marching camp during that Roman Emperor’s invasion into what would become Scotland. Start at the visitors centre at Ancrum. The path is wooded and follows the old Roman road of Dere Street. Cross the Teviot via a new suspension bridge. Eventually you come to a long road section between Cessford and Morebattle. It’s worth taking a look at the impressive ruin of Cessford Castle. You then have a steep climb up Wideopen Hill and from here it is down to the SYHA at Kirk Yetholm. But you must remember that this is the end of the Pennine way and to be guaranteed a bed you should book ahead. Historical facts: Cessford Castle was built around 1450 as an L- plan Castle. The name "Morebattle" is not derived from a military encounter. An academic study has been made of the distinctive Southern Scots dialect as spoken at Morebattle. Read more about medieval castles. You are now entering Hill fort country and appropriately will cross the border line today. A short and steep climb up Coldmouth Hill is followed by the descent into the College Valley and the medieval village of Hethpool. The College Valley covers just over 12,000 acres of wilderness and encompasses the Cheviot itself as well as many archaeological sites. You will cross the College River and then start to climb towards the Newton Tors. The feral goats of the College Valley with their distinctive blue/grey colouring are often found along this section. As you reach the top of the hill you will also come across the distinctive squares of burnt heather associated with grouse shooting. The path then drops down into the market town of Wooler and the welcoming YHA. There are also plenty of Inns and B&Bs in Wooler. Historical facts: About 1/4 mile up the valley from Hethpool there is a large Neolithic stone circle. The valley was owned by Admiral Collingwood who fought alongside Nelson at Trafalgar. He planted oaks along the small hill at the bottom of the valley. It is now that you need to look at the tide timetables and decide when you wish to cross over to Lindisfarne. The answer will dictate where you stop for the evening on day 4. Weetwood, the river Till and lovely woodland walks take you to West Kyloe farm where a well laid out camp site awaits. There are no villages or natural stopping points along this section. Historical facts: The Glendale plain once held a large lake based around Millfield. You can see the plain clearly as the Way crosses the Newton Tors. Kirknewton church, just below the Tors is where the Victorian social reformer, Josephine Butler, is buried. The hills around Kyloe are a great place to find the ancient cup and ring marks which are carved into the rock formations. Read more about the history of Northumberland. From Kyloe it is approximately 3 miles to the Causeway at Lindisfarne. You have to cross the busy A1 as well as the main east coast railway line running between Edinburgh and Newcastle. 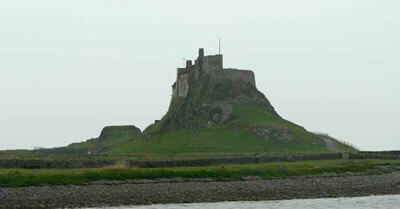 When you cross over to Lindisfarne it is worth noting the reservation in the centre for anyone caught out by the tide. There is also the option to cross the sands as opposed to staying on the causeway. Historical facts: The monastery at Lindisfarne was founded in AD 635.It was here that the famous illuminated Lindisfarne Gospels were transcribed during the 8th century AD. A Viking raid in 793 AD signalled the start of many such visits. The Castle was built on the site of a Norman fort but never had any military significance. It was the home of Edward Hudson, the editor of Country Life.